STARTING TODAY and running for the next six days, you can pick up my novella, The Gods of Moab, for your Kindle at the special discounted price of 99¢ (regular price $2.99). 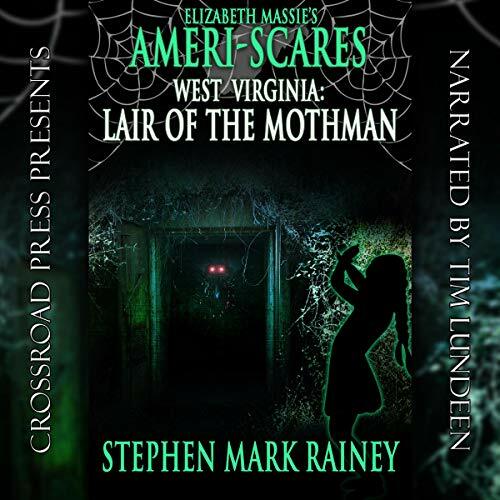 "A pleasant New Year's Eve outing becomes an experience in otherworldly horror when two close-knit couples discover a shocking secret in the darkest corners of the Appalachian mountains. At an opulent mountain inn, Warren Burr, his fiancee, Anne, and their friends, Roger and Kristin Leverman, encounter a religious zealot named John Hanger, who makes it his business to bear witness to them of his peculiar...and disturbing...faith. 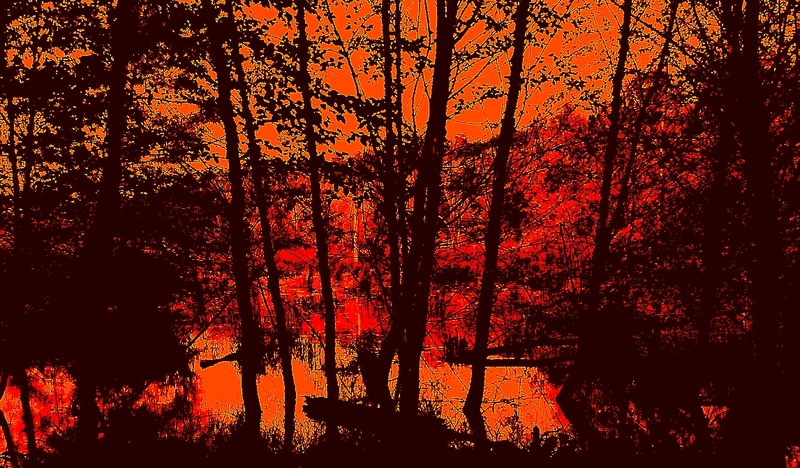 His efforts rebuffed, Hanger insidiously assumes control of the couples' technological devices, leading them to stumble into unexpected, surreal landscapes...landscapes inhabited by nightmarish beings that defy explanation and rationality. To return to the world they thought they knew, Warren and his friends must not only escape the deadly entities that pursue them but somehow stop John Hanger's nightmare-plague from spreading to the outside world. 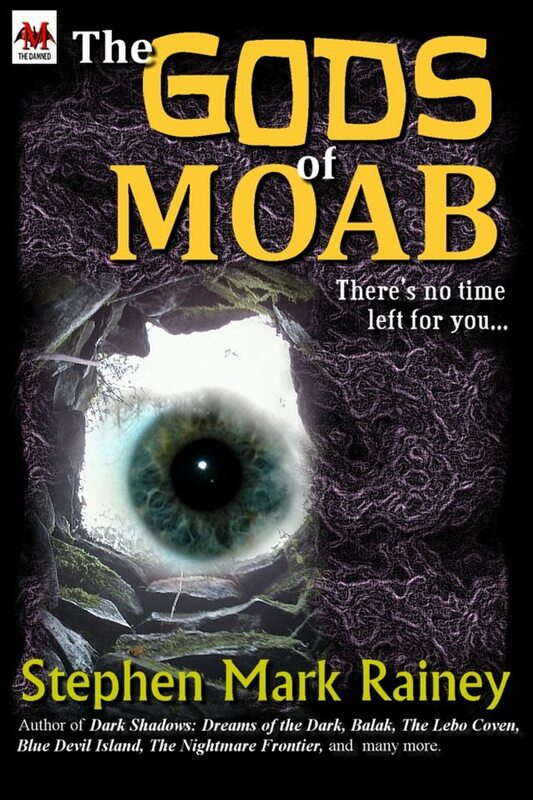 "The Gods of Moab is a chilling novella of Lovecraftian horror by Stephen Mark Rainey, acclaimed author of Balak, Blue Devil Island, Other Gods, The Nightmare Frontier, Dark Shadows: Dreams of the Dark (with Elizabeth Massie), and former editor of the award-winning Deathrealm Magazine." Love it or hate it, Amazon.com reviews are always appreciate. Do enjoy! ...makes you invincible! I tell you, it's the best burger I have ever suffered through: the Welsh Dragon Burger at The Celtic Fringe in Reidsville, NC. It's a a third-pound Angus beef patty simmered in their one-and-only Welsh Dragon ghost pepper sauce and topped with pepper jack cheese, candied red cabbage, arugula, and mayonnaise. (I even like to dip my french fries — which are excellent, by the way — in a side cup of the sauce.) Make no mistake, this is pure, delicious, wonderful hellfire! The flavorful, perfectly cooked burger; the candied red cabbage; and just a veneer of mayo perfectly complement this sweet but fiery ghost pepper concoction. Inevitably, if you order a Welsh Dragon Burger, your server will ask you if you're aware of what you're getting into, and justifiably so, as I can only imagine the folly of some tyro with a passing fondness for hot sauce going all-out with one of these. Not a good idea, my friends. 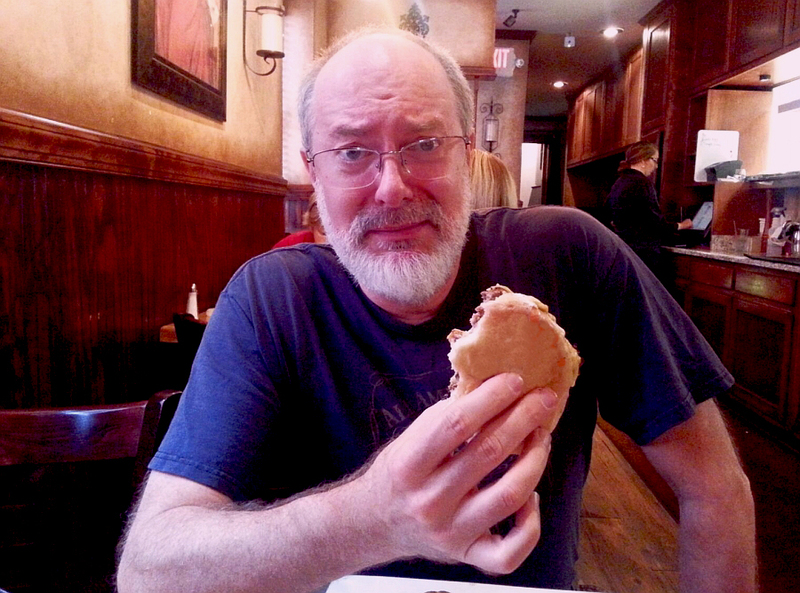 I will mention that I've turned a couple of folks of my acquaintance onto this burger — in one case favorably; in the other, not so much. If you are invincible, I invite you to come round one of these days and join me at The Celtic Fringe. There's a good selection of beer, wine, and assorted spirits to wash it down. Trust me, you're gonna need 'em. Just a quick entry here for future personal recollections. It's bloody ugly out there — too warm, too muggy, too damned wet. At least it wasn't raining this afternoon when Kimberly came round for us to head to Martinsville. 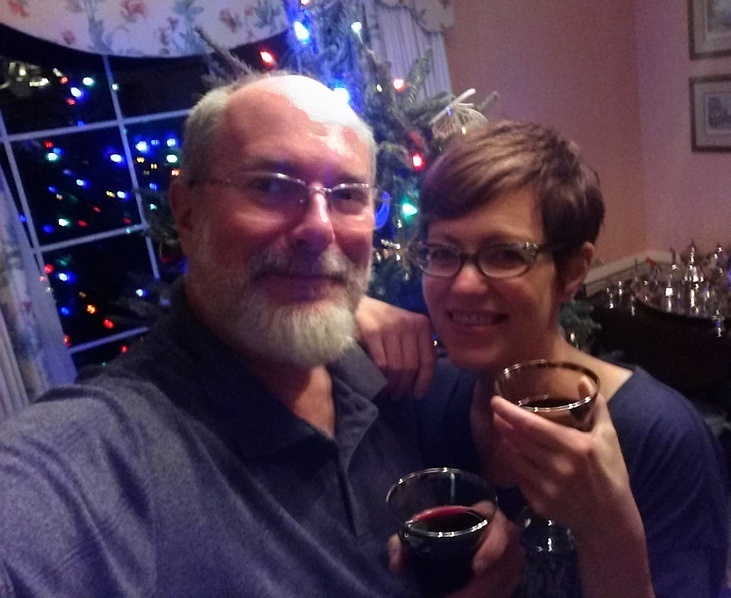 We started Christmas Eve right enough, with a visit to the Grove Winery (after snagging a new-ish cache at High Rock Road), where we enjoyed an excellent tasting and a glass each (Nebbiolo for me and Cabernet Franc for the lady). Then on up to Mum's and dinner at Rania's, which was quite good. Back home with us for a bit more wine (Chateau Morrisette Sangria, which is delicious — spicy and just a little sweet), the wrapping of presents, preparing tomorrow's dinner, and the requisite viewing of A Christmas Story. All in all, a very pleasant time. Not sure at this point what the forecast for publication is, but I'll keep you posted. 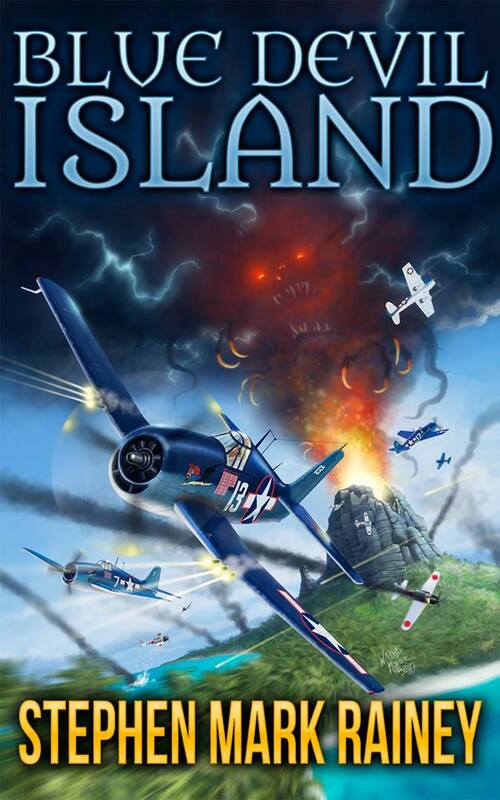 The novel is also available as an eBook, if you prefer, for only $3.99. Order the eBook here (Amazon.com). 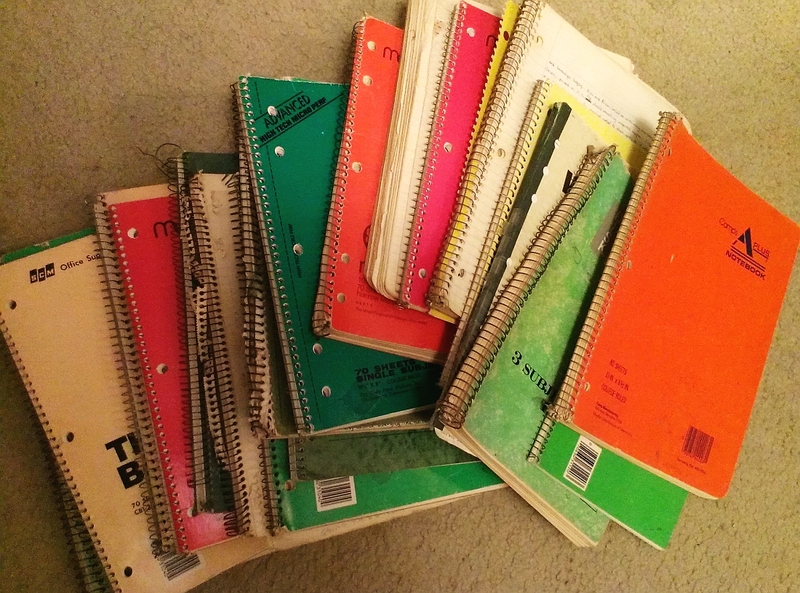 From the mid 1970s through the late 1980s — even into the 90s — I managed, documented, and illustrated my life via a succession of spiral notebooks, most of which I've kept to this day in the deepest, darkest recesses of the vault. This evening, a fragment of the lyrics to an old song I wrote, probably in 1983, sprang to mind, and I got it into my head to try to find them in their entirety. I figured if those lyrics exist anywhere, they'd be in one of those old notebooks. So I ventured into the vault, grabbed a bunch of the notebooks (a portion of which are shown above) and commenced to searching. I had almost forgotten how many hundreds of thousands of words exist in those pages. Some go back to high school, when I doodled pictures and wrote things that almost resembled stories. Most are from college and post-college days, many chronicling dreams I had (in those days, analyzing and learning to manipulate the events in dreams was a hobby of mine). Looking at them tonight, I found some of the descriptions vivid enough to jog actual memories of those dreams. Some pages are random musings — thoughts and observations from whatever chapter of life I was living at the time. The page reproduced below indicates I had apparently encountered a child somewhere. One page from one of those volumes has the words "Hey Cutie!" scrawled on it. That was from a trip to Washington, DC, I took in 1978, with my college roommate, Charlie Perkins. We were driving up U.S. 29, somewhere around Charlottesville, VA, and an exceedingly attractive young woman kept passing us up and then dropping back. 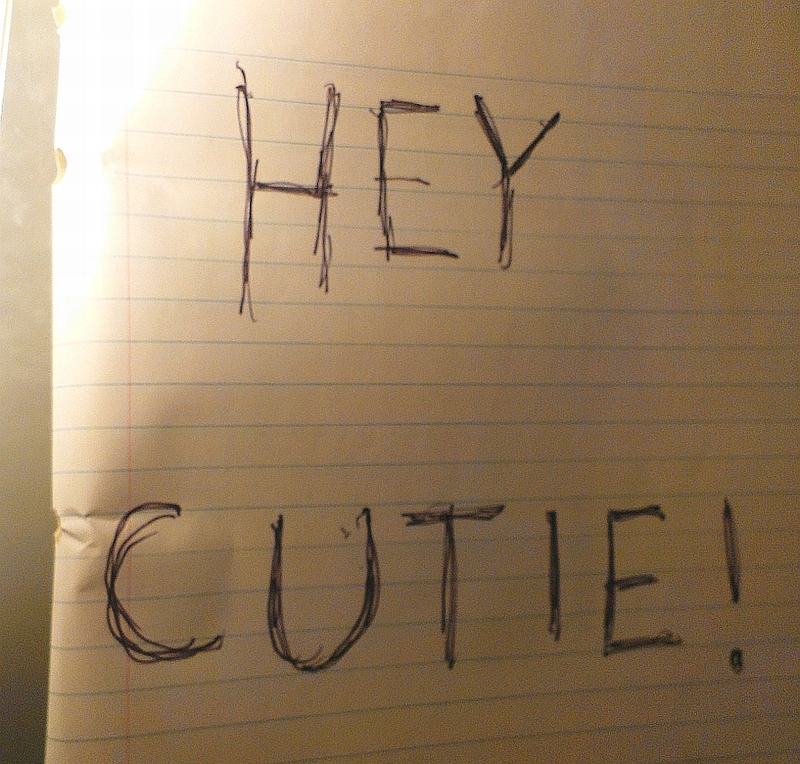 Eventually, I managed to scrawl that message in the notebook, which Charlie held up for her to see. At that point, there was serious laughing and waving, and it's a wonder neither car ended up in a ditch or up a tree. Later volumes, from the mid 1980s, feature original drafts of novels I attempted to write. Some include the first drafts of stories that eventually got published — such as "The Gray House," "Threnody," and "The Spheres Beyond Sound." There are a few almost polished drawings from my days living in Chicago, such as the character in the photo at left — some chap named Czerim Aignar, who was an original creation used in a role-playing game that several of us played on a regular basis. One notebook was a ledger from Deathrealm magazine, circa 1988. On the first page I turned to, the first name I noticed was film producer/director Frank Darabont, who was apparently a regular subscriber. I found the lyrics to dozens and dozens of the songs I wrote between 1978 and 1986. Except for the one I was looking for. I couldn't find that one. It's unlikely, I imagine, that those lyrics will somehow round themselves up and reform in my mind, so perhaps they are relegated to the dustbin of my personal history. And given the relative merit of some of those oldies, perhaps it's just as well. 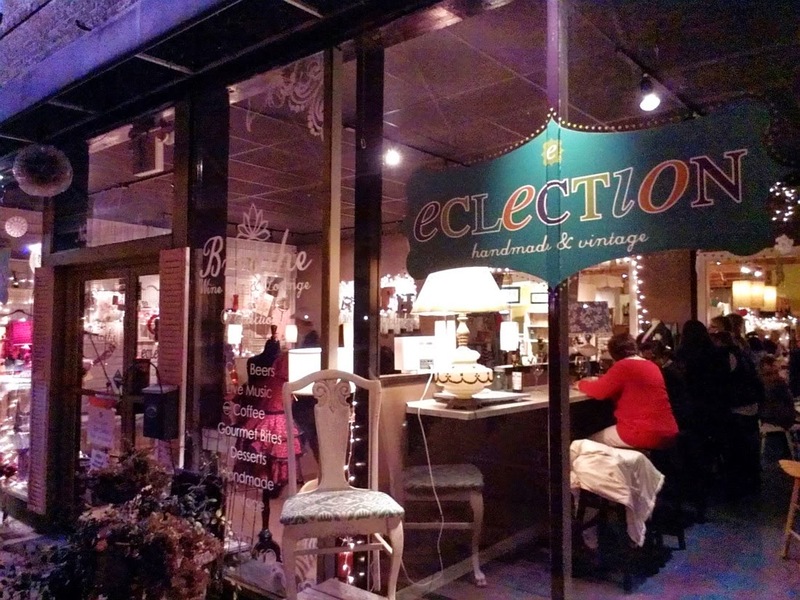 And on that note, just a reminder that, if you're in the Piedmont Triad of NC, come on by to Eclection in downtown Kernersville tomorrow (Thursday) night, 7:00 PM sharp. I'll be making a racket at open mic night, and I'd be more than happy to see you that I might just shake your teeth loose. Beware! On Thursday, December 10, noise-making, guitar-playing, ruckus-raising horror writer is scheduled to do the open-mic thingy at Eclection, in downtown Kernersville, NC. If you value your insanity, you should surely come! I plan go on about 7:00 PM, give or take a few minutes, and I'd love to see you. Eclection quite lives up to its name. In the refreshment department, it offers a juice, coffee, beer, and wine bar, nicely stocked, along with sweets and small plates from various local establishments. You'll also find innumerable aisles and corridors filled with antiques, crafts, artwork, jewelry, apparel, home furnishings, and more, all provided by local artisans and vendors. You can enjoy a drink at the bar, in one of several intimate alcoves, or in the main entertainment area up front. Or you can carry your glass of wine with you while wandering among the booths and cubbies filled with handmade and one-of-a-kind items that even an old curmudgeon with no general interest in such things does mightily approve. I'll post further reminders as we get closer to the date. In the meantime, I plan to practice, practice, practice, so that when the time comes, no one will leave the place unchanged. 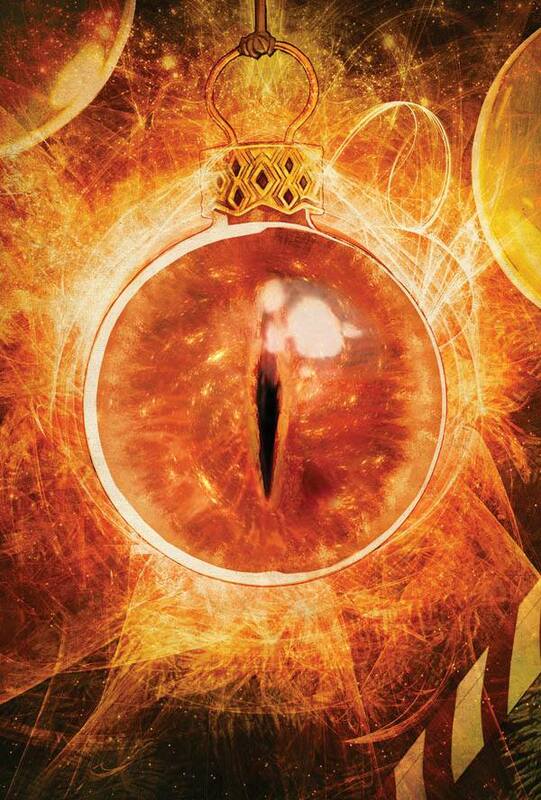 That's not actually Sauron you're looking at there. It's a mean, mean Christmas ornament, as illustrated by artist Zach McCain for my story, "Red Rage," coming up in Dark Regions soon-to-be-released anthology, Christmas Horror (volume 1). Editor Chris Morey plans to release subsequent volumes annually, each in time for the Yuletide season. The books will be available in ebook, trade paperback, and deluxe hardback editions. In addition to my tale (which you can read more about in my blog entry, "Red Rage for Christmas," Oct. 6, 2015), the debut volume features all new and original stories from authors Joe R. Lansdale, John Skipp, Cody Goodfellow, Jeff Strand, J. F. Gonzalez, Nate Southard, Shane McKenzie and (in deluxe hardcover retail editions only) William Meikle. Each story in this volume features a full-page illustration by Zach McCain. Give the gift of horror this Christmas. And keep a little for yourself.